Surviving Schizophrenia by Dr. E. Fuller Torrey and I’m Not Sick, I Don’t Need Your Help by Xavier Amador. I haven’t found a lot out there for siblings (My brother was diagnosed with schizophrenia 10 years ago); but I just ran across an excellent book – The Normal One: Life with a Difficult or Damaged Sibling by Jeanne Safer. I highly recommend it to the siblings out there. I am the caretaker of my adult son who was developed Schizophrenia when he was 19, I found these books helpful in understanding what he was going through. 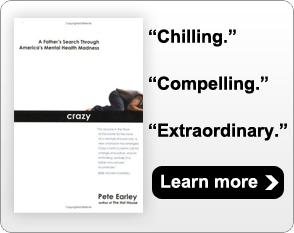 Ditto to Amador’s “I’m not sick…” but nothing has helped us more than Crazy, by Pete Earley! We live in NoVa and the hardest part by far has been navigating the legal system–getting care for an acutely psychotic adult who thinks he is “fine”. Your book kept us sane when dealing with a system that is completely broken, let us know that we are not alone, and helped us learn to advocate in a effective way. A book you recommended in a blog called SHRINK RAP by three doctors has been very helpful. It is filled with good, practical advice. A new book by Rita Keeley Brown titled “Good Luck, Mrs Brown” is a remarkable story of courage and love for the father of six children of a family dealing with his schizophrenia spiraling out of control. Rita is an amazing person and, as the mother in the family, she raised six remarkable children with a respect for mental illness and, in spite of all the tragedies, a never-ending love for their father. This is not a resource book, but rather a book of hope, courage, faith and love – four things that are often hard to hold on to in the midst of crisis. In Her Wake: A Child Psychiatrist Explores the Mystery of Her Mother’s Suicide by Nancy Rappaport is a fascinating look by a professional into her own mother’s psychiatric battles and ultimate suicide. It’s helpful for anyone who has a parent with a mental illness. I’m not sure if this recommendation is exactly the kind that you all have in mind, but “The Psychopath Test” by Jon Ronson is a highly entertaining book that will also educate you about psychopathy, those who have been diagnosed with it, how the legal system is dealing with it, and those doctors who have been doing the diagnosing. There’s a LOT more dissension in the ranks than I ever thought! The way that the mere definition of psychopathy has evolved is fascinating and head-scratching at the same time. It’s enjoyably readable and even funny at times. The author reminds me of Pete Earley, in a way, b/c the way he writes draws you & makes the book hard to put down. those dark days, I used your book as reference, guide and mostly for hope. I have written two books as an effort to inform and educate people about bipolar disorder. The first was “Sugar and Salt: My Life with Bipolar Disorder,” and the second is “Reboot: A Novel of Bipolar Disisorder.” Both books attempt to show the devastatiion caused by the disorder, and the actions a person can take to mitigate the damages of the disorder. The first step is diagnosis, then comes finding the proper medication and staying on it to prevent a reoccurrance. People with the disorder will want to read the books to learn about how it works in another’s life; firends and family members will gain more understanding of the disorder and its effects.